Why I haven’t blogged about the pigs? After all I’ve written about many aspects of my family life, including the allotment produce, so why not the pigs? Some of you reading this might be thinking what pigs? That’s understandable too as I’ve not written about them much. We keep pigs as part of a group. I say we, but this mainly means my husband because he normally has the car and the spot where we keep them isn’t within a safe walking distance so the responsibility falls to him. The majority of pigs in Ireland are kept in battery-style conditions. Many of us are concerned about whether our eggs come from free range or battery kept hens, we know that most cows and sheep in Ireland are grassfed and clearly free range, so why don’t we ask about where our pork comes from? 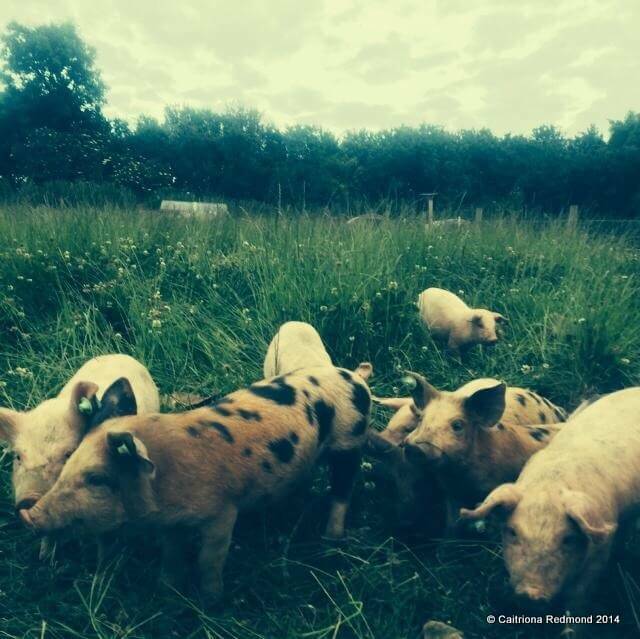 It’s rare to see pigs kept in a free range situation but that’s what we do. The 5 year old yesterday asked me why we don’t go to the circus after seeing the posters up around the town. I explained that we never go to any circus that keeps animals because we don’t believe in forcing animals to live in cages. This extends to our pigs. They’re kept free range and have a great life. They have plenty of shade under trees, water to wallow in, there is a herd so they play with one another. In particular the 5 year old is very conscious of how important it is to treat animals well, even if they’re reared for the table. He will often ask when eating pork if it’s from our own pigs and say he’d rather eat that than what comes from the supermarket. Every now and again I succumb to a Superquinn sausage but the truth is there is no comparison for flavour between supermarket or butcher bought pork and free range pork. It tastes like pork should is the easiest way to explain it. Grandad (97) says that it tastes like pork used to. One of the reasons why I haven’t really blogged about the pigs is because I’m aware that we’re just a cog in the machine that rears and cares for the pigs. They’re not “ours” because it’s an effort between a community of people who all believe the same thing. Another big reason is because the last time I spoke publicly about the pigs we ended up with loads of visitors and people dropping down to take a look at them like we ran an open farm, and that caused a bit of hassle. The pigs are kept on land belonging to the Local Authority and the group is supported by them in doing so. Does having our own pork and growing our fruit and vegetables mean that I can give realistic supermarket or portion prices on the meals I cost for the blog and elsewhere? Yes it does as everything I cost is based on supermarket prices and doesn’t take into account our home reared/grown food. We save a little bit more that way but I’m very aware that we are lucky to be able to do this. I suppose why I don’t talk about them so much. I don’t want you to feel like I’m ramming free range pig rearing down your throat. It’s what we’ve chosen to do, it doesn’t mean it’s what you should do. Maybe, just maybe you might look at the pork/bacon/ham on your plate the next time and wonder where it came from though. Caitriona, one of the best examples I know about well kept pigs is from Co. Fermanagh in Northern Ireland. Pat O’Doherty started breading Saddleback pigs on Inishcorkish Island in Lough Erne. There they get to live freely and roam the island foraging for their own food. Not surprisingly Pat’s bacon has won several awards. Oh yes I remember that episode! I’m just after enjoying a yummy rasher from our last batch. There is simply nothing like it!